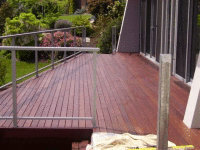 Jarrah Deck - Treated with exterior natural timber oils. 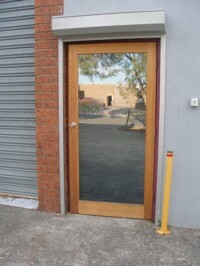 Livos external oils contain pigments to help protect against UV rays and weathering. Rejuvenation is necessary however intervals are dependant on it's location and exposure. 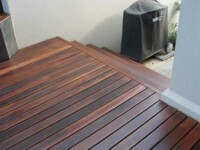 After building construction was complete, the Jarrah deck was cleaned with a high pressure cleaner, allowed to thoroughly dry and then treated with the Livos decking oil in teak stain. 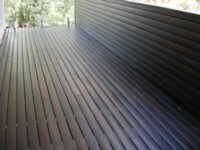 Ironbark decking - Treated with 2 coats of Alis Decking oil. 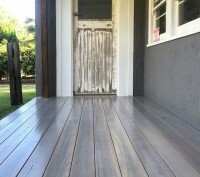 Grey Ironbark decking treated with 2 coats of Alis Decking oil in the oak stain. The natural decking oils are very economical. No peeling or cracking will occur. Varnish had cracked, timber was greying off and required sanding back prior to oiling. 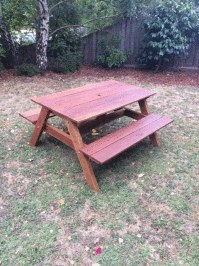 The left side: has been treated with Alis Oak Stain Pigmented Oil, however highlighting the Spotted Gum markings. 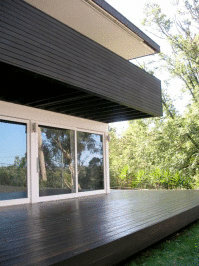 Contrasting Alis grey stain on the deck with the black Alis on the weatherboards. Black Deck - Want a different look? Creating a different look is not difficult. 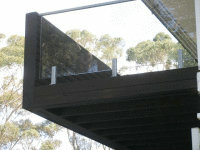 Deck treated with Alis Black. Black Deck - Create a different look with ease. 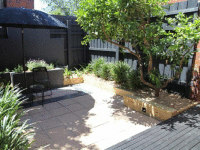 Black deck - Creating a different look is not difficult, deck treated with Alis Black decking oil. 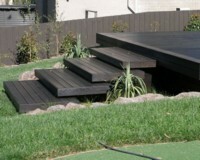 Black deck - The natural decking oils come in a variety of stains. Letter Box by R Crompton - These natural timber oils are incredibly versatile. 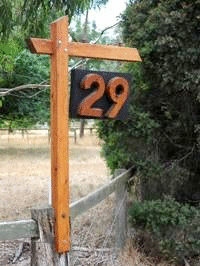 The post is Cyprus pine. 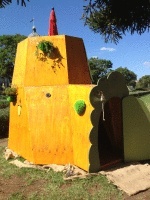 Ply Cubby House - Treated with Alis natural Decking oil in the Boxwood stain. 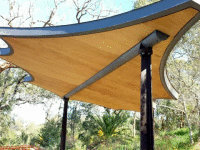 Ply Cubby House - treated with Alis natural Decking oil. Another stunning black deck, Treated with Alis Black. Fence and screen also treated with the Alis black decking oil. 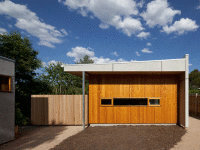 Lifehouse - external walls treated with the Alis Natural Decking Oil. Silver top ash treated with the Alis decking oil in the boxwood stain. 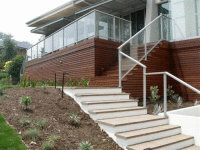 Kings Park Perth - Treated with Alis Natural Decking Oil. 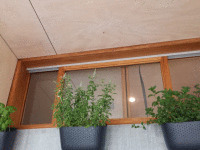 Window frames treated with Alis boxtree stain. No peeling or cracking will occur. Magnesium oxide board oiled with clear, ply treated with Kunos white and frames in Alis. No peeling or cracking will occur. 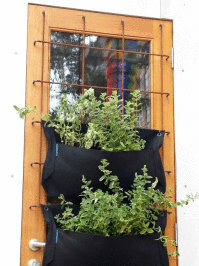 Novel way of utilising space - The external oils are water repellent. 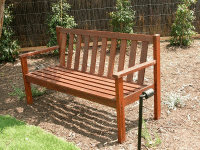 Exterior Bench - Treated with the external natural timber oils. 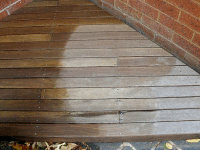 Treated with Livos decking oil in teak stain. Boat Surface - Treated with Alis. 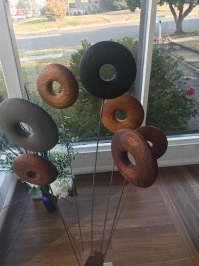 The external oils are water repellent and protect against UV and weathering. 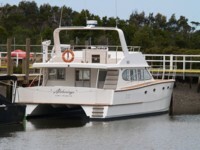 Boat deck treated with Alis non toxic decking oil. 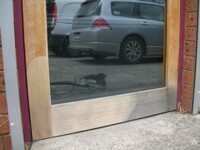 The external oils are water repellent and protect againts UV and weathering. 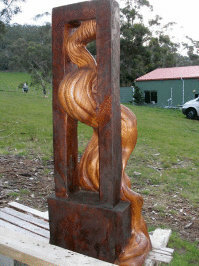 Timber Sculpture - Livos natural decking oil was used on this external sculpture.